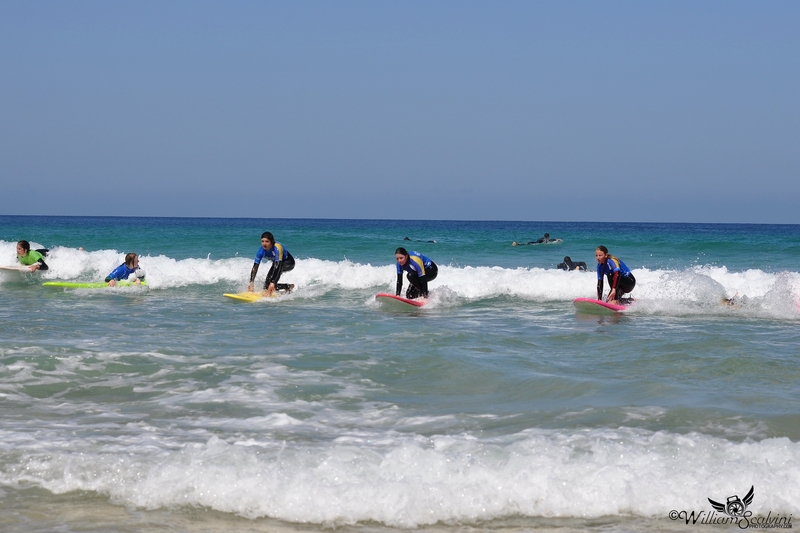 Our surf camps on the Canary Islands, the European Hawaii – a must for every surfer, no matter the skill level! There is a vast amount of world-class waves to surf on the seven main Canary islands and the two little islands Lobos and La Graciosa. Surfers of all skill levels, from beginners to advanced surfers, can find amazing waves here any time of year. Because of its geographical location, the weather in Fuerteventura is very good throughout the whole year. The island lies directly in front of the African coast and can therefore be quite easily reached by plane from anywhere in Europe. 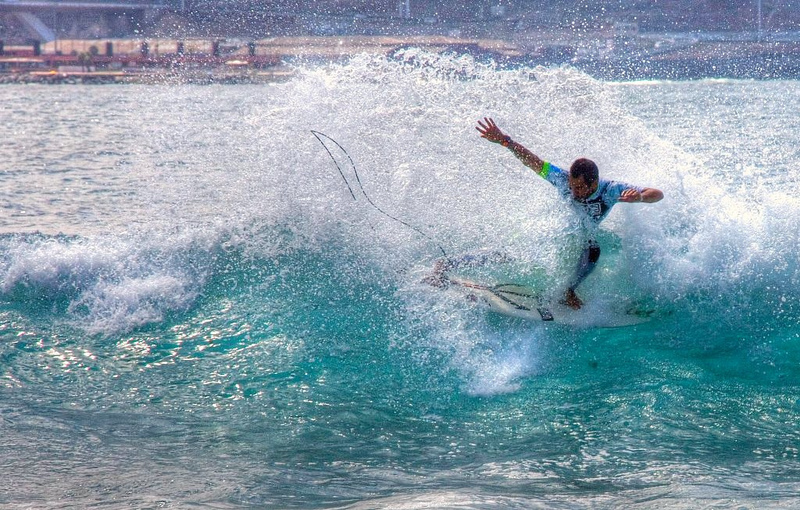 Since we don’t want you to miss out on these great surf destinations, we have a surf camp in Fuerteventura and a surf camp in Tenerife to offer you. Besides being situated on the Atlantic Ocean, our Surf Camps Canary Islands have the big advantage, compared to other European surf destinations, of being shaped in a way that waves are guaranteed every day of the year. If the waves do not come from the north, then there is swells from the south, east or west! The Canary Islands, or the Hawaii of the Atlantic, are considered a blessing by European surfers. Formed millions of years ago through volcanic eruptions, this Spanish archipelago consists of seven main islands: Fuerteventura, Lanzarote, Tenerife, La Palma, Gran Canaria, El Hierro and La Gomera, all of which provide pretty perfect surfing conditions. Thanks to their location close to Africa’s West coast with only the Atlantic to their left, the islands receive open ocean swells that break over shallow reefs creating a variety of different waves. Another advantage of their geography is that the islands lie on the same latitude as Morocco and Western Sahara, so they profit off of that amazing subtropical climate. Explre the Surf Camps Canary Islands! Fuerteventura has become many people’s favourite – an endlessly long coastline on the East and West side, gorgeous sandy beaches, desert-like landscapes and great waves 365 days a year. There is truly no bad time to stop by our Surf Camp in Corralejo as you can always expect the weather to be pleasantly warm. 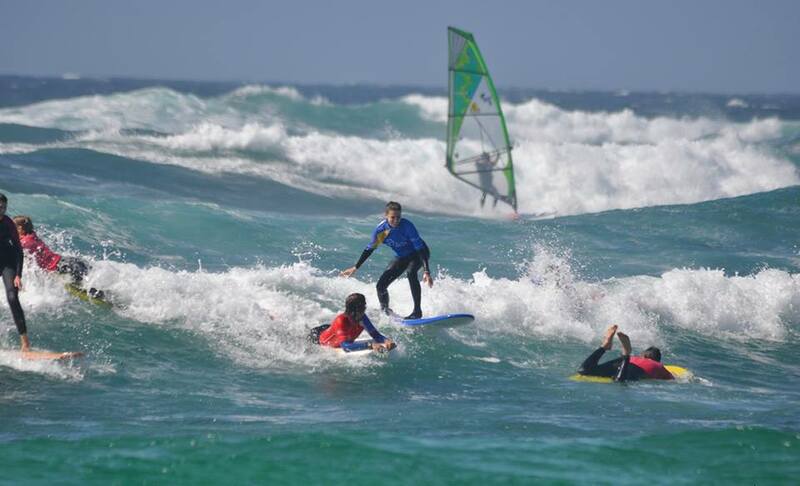 Fuerteventura is also amazing for other water sports such as windsurfing and kitesurfing due to the strong winds it receives during most of the year, so if you ever feel like branching out to surfing’s sister sports, this is the place to do it. The winds do tend to calm down in the winter season, but at any time of the year it takes just a drive around the different spots to find the perfect one for yourself. Gran Canaria’s most reliable and consistent surfing region is the Northern coast, however many of the spots here can be dangerous. There are virtually no surf spots on the West coast because the coastline is sealed off by cliffs, but the Eastern and Southern sides are home to many wonderful breaks that can be surfed any time of the year. 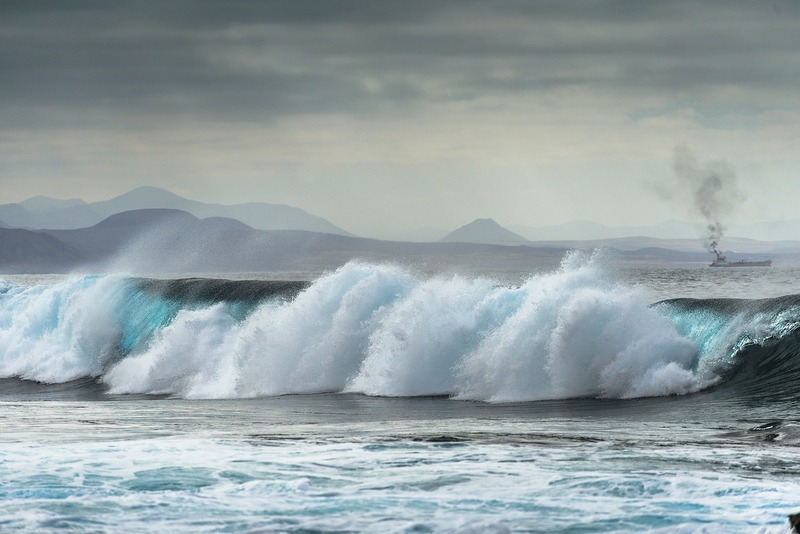 Lanzarote has an outstanding quality to produce intense waves even on a small swell. However, there are strong winds that can really be a problem sometimes. 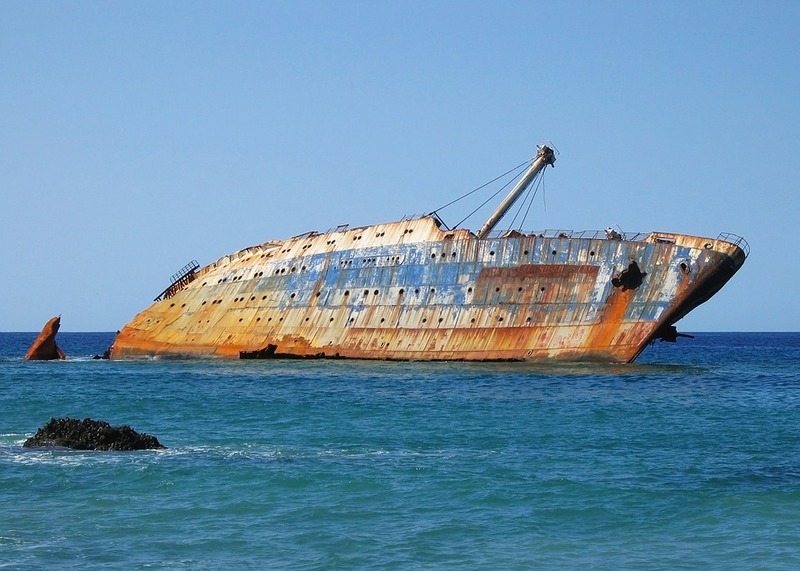 The NE trade winds only suit a few beaches and the desert wind, Sirocco, can stir up trouble in the waters. But on the bright side, the Sirocco also produces the longest wave on Lanzarote! Tenerife is the most crowded island for sure, both due to the large number of inhabitants and the island’s popularity as a tourist destination. What this means is that the best surf spots will likely be crowded and locals don’t always appreciate too many foreigners on their line-up, but the spectacular breaks are worth it. The main surf regions could be divided into North and South. The rest of the islands are less popular surfing destinations, but there still is some pretty good spots to be found on La Palma, La Gomera and El Hierro. Some say The Bubble is the best Fuerteventura has to offer, however these ‘some’ are likely advanced surfers – this spot tends to scare beginners off with its mighty and fast rights. It behaves best on NE swells and low tides when the waves are around 5ft tall. The Bubble produces shallow and hollow waves that tend to barrel out on the most favourable of conditions and break over a shallow and sharp rocky reef, so caution is advised! Even though this spot offers a powerful beachbreak with a tendency to form barrels in some parts, it’s much more friendly than The Bubble and welcomes intermediate surfers. The waves here are great, but the spot can get a bit crowded. Cotillo can perform on any tide, but works best with a SW/NE swell and Easterly winds. If you booked a beginner course at Planet Surf Camps Canary Islands, you will see Cotillo for sure. 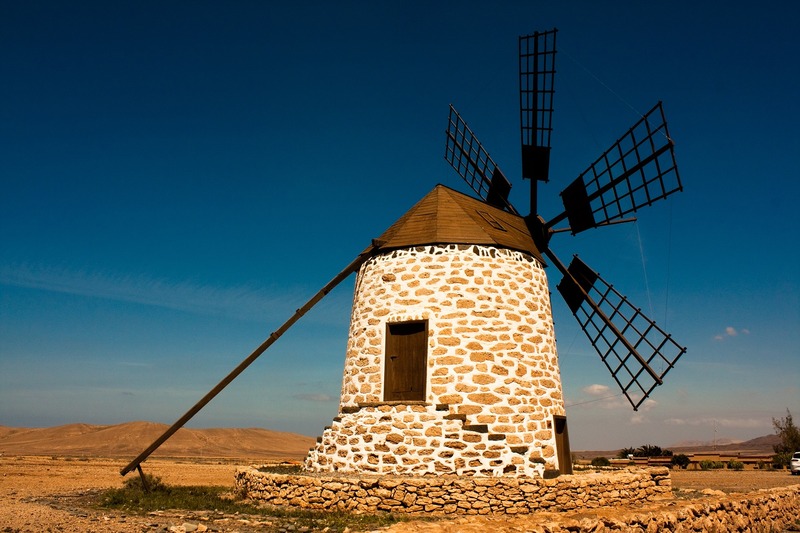 Cruz Roja produces one of the most gorgeous rights on Fuerteventura. The spot is known for its beautiful sandy beach break, but its appeal is not limited to surfers – the waters are well seasoned with bodyboarders, so watch out. Salinas is a gem that works best on the biggest of NW swells when it forms a perfectly fast and hollow right-hander. This spot is probably better suited for experienced surfers as there’s a few challenges to face once you’re there (if you even find your way, that is) – Salinas gets really crowded with locals, especially on weekends, and there’s things like sea urchins, sharp reefs and strong rips to think about. If you feel up for the challenge, the best conditions to go are on a NW swell and Easterly wind, which will likely reward with waves up to 12ft. La Pared is a pretty perfect beginner beach, as the peaky waves it produces are not too intimidating, they break onto a soft sandy beach and if you go early enough in the day, the wind shouldn’t really be an issue. There are strong rips to watch out for, but nonetheless, La Pared is a safe place to learn. It performs best on a S or N swell and SE wind when you can expect friendly 2-8ft waves. Los Lobos is a pretty exciting spot located on the shore of a small island North of Fuerteventura. If you’re up for an adventure and have a free day, catch a ferry from Corralejo, where Planet Surf Camps Canary Islands is based, and enjoy the longest waves in the Canaries. You can expect rights up to 500m long breaking over sharp reefs, but the spot is pretty resourceful and there are sections of the break to satisfy all surfers. Sharks have been known to visit the area and booties are highly recommended. Lobos is most surfable at low to mid tide. El Hierro is a superstar spot on Fuerteventura, its speedy and strong left attracts quite a lot of attention and the shorter, but barrelling, right is popular amongst more advanced surfers. El Hierro works on all tides and the waves break over pretty deep water anyway, but booties are advised just in case. The peaky waves of Bajo del Medio break just in the bay of Corralejo, especially on big W/NE swells and a SW wind. 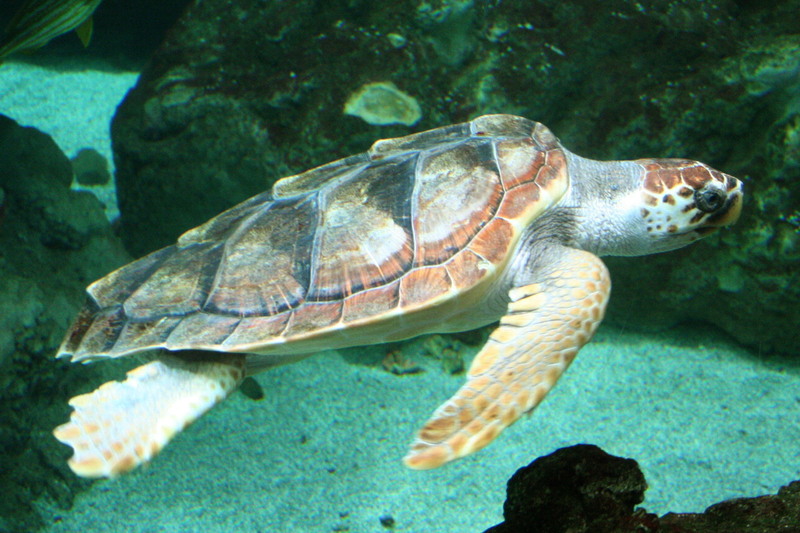 It produces a long and mellow right and a more powerful fast left breaking in deep water over sand. This nice array attracts intermediate surfers and plenty longboarders. This spot is pretty consistent all year round and it’s perfect for beginner to intermediate level surfers. This beach break offers rights and lefts over a safe sand and rock bottom and a beautiful wide beach. Famara Beach is great for visitors as the local vibe is quite relaxed and localism in the water isn’t really an issue. Best on a NW swell and SE wind. A challenging, but rewarding spot that produces effortlessly long point break right-handers breaking over a rocky reef bottom. La Santa is best when left to the more experienced surfers, as the waves are seasoned with locals, so do show respect and hang back for a bit and show your skill before going for the peak. There’s also rocks and sea urchins to be aware of. San Juan is just next to Famara Beach and it offers similar conditions, so if that spot ever gets too crowded, this is a great alternative. The left reef break is perfect for intermediate and learning surfers especially on a lower tide. This spot caters to intermediate surfers offering both a left and right. The long left and slightly shorter right break over volcanic rocks, so it’s best to surf Punta Mujeres on a mid to higher tide to avoid injuries. This break works best on N or S swells. This spot offers the perfect conditions for beginners, especially if you want to try out longboarding. This point break is as safe as they come and is known to produce long rides. The only issue is it can get crowded, but that’s to be expected from a spot this good! El Confital is a fantastic spot for more advanced surfers as it produces super hollow right-handers breaking over sand and rocks that form the most amazing barrels. 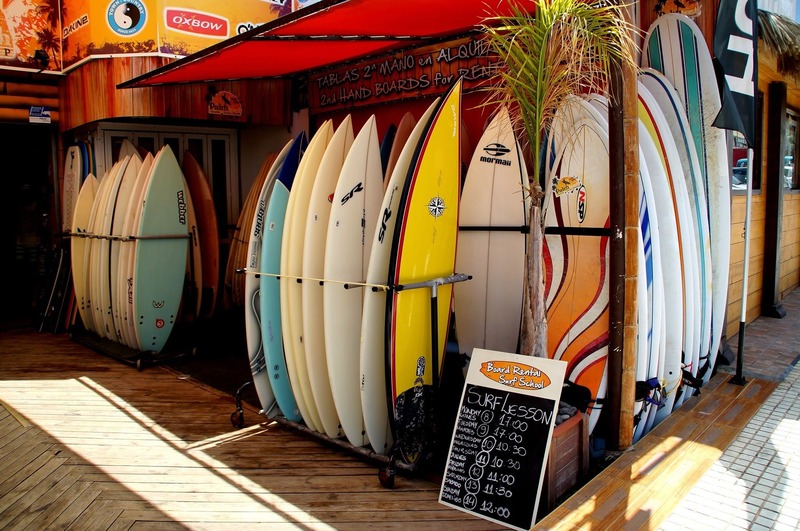 Its location in the capital city of Gran Canaria, Las Palmas, and the sheer perfection of the wave do attract a large crowd of locals, but as long as you’re respectful, you should be fine. It works best on big swells and a high tide. This spot is amazing due to its remarkable consistency, there just seems to always be waves. This reliable point break right-hander breaks over a slightly dangerous rocky bottom, which makes this spot pretty limited to advanced surfers. 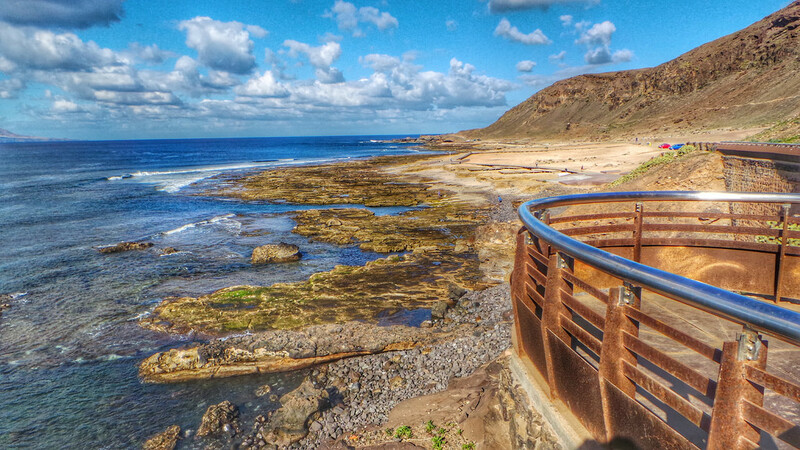 La Izquierda, or “The Left”, is a pretty famous spot located in Playa de las Americas. This one is usually reserved for advanced and experienced surfers. The break is fast and powerful and it breaks over a sharp coral and rock bottom that you really need to watch out for. Adding to the challenge are the sea urchins covering the bottom and the crowd of locals you can always safely bet on finding there. But, if you dare, you may just get rewarded with one of the sweetest rides you’ll find on the islands. The wave offers barrelling sections and it works on all tides, 365 days a year. It works best with a W/NW swell and an E wind. La Fitenia is just one of the many spots located in the famous holiday resort Playa de las Americas in the South of Tenerife. It’s great for intermediate to advanced surfers and produces perfect lefts and rights breaking over a sharp rocky reef. The rights tend to give longer rides, often upwards of 150m. The best conditions for this spot are SE/SW swells and N winds when it holds up to 12ft swells. This lovely peaky beach break breaks over a sandy bottom and can be pretty powerful. Sometimes it requires a difficult paddle and you need to watch out for rips, but it’s very consistent and it works on all N swells and on all tides. It will perform best though with a SE wind and it’s best to go anytime other than the summer when it can get a bit crowded. La Gomera is home to a pretty awesome spot called Hermigua, which produces powerful and really long rights and lefts breaking over sharp rocks and reefs. It’s recommended for experienced surfers, not only due to the size of the waves and dangerous bottom, but you may find strong rips and eels swimming around in the water, so only surf Hermigua if you feel confident in the water. It works best on N/NE swells and same with winds, but it’s not reliant on tides. Probably the best wave on the island is La Laja de Tecoron. It’s a right hand point break above a reef bottom that’s suitable for every type of surfer. The wave is pretty short, but fast and powerful and it does get pretty big. The most suitable surfing conditions are S/SW swells and N/NE winds, but it works on all tides. 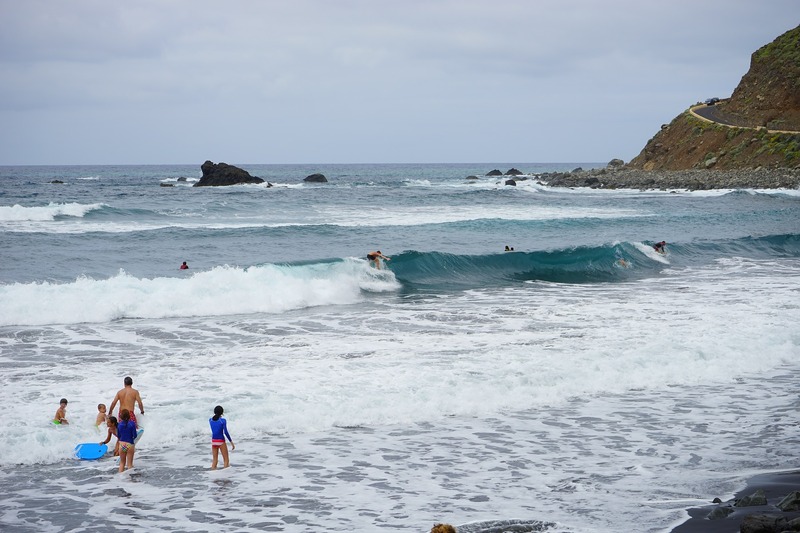 A fun spot to visit when on a surf holiday on La Palma is La Zamora. It offers a long and powerful right-hand beach break over a rocky bottom. It’s perfectly suitable for all surfers, but you do have to watch out for rocks. It performs best on an E swell and W wind. 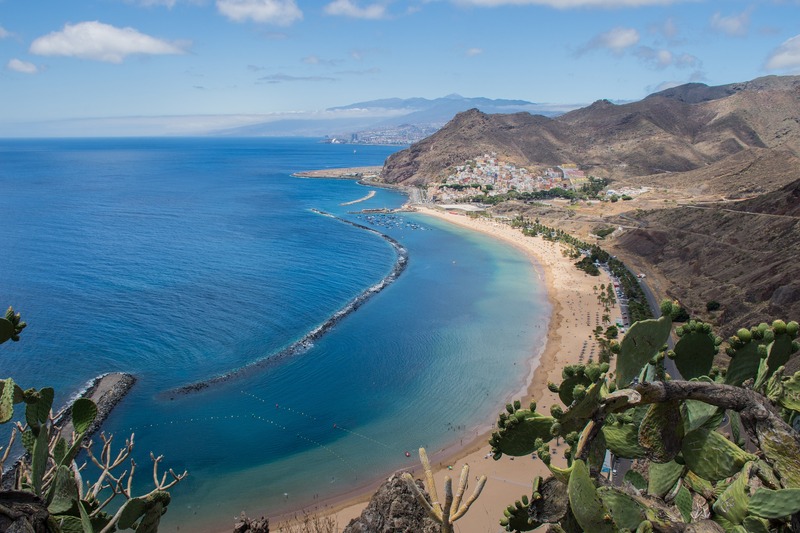 The Canary Islands’ coastline is too extensive to list all of the possible surf spots available, these are just some of our picks, but to check out more visit Magic Seaweed or WannaSurf. The history of surfing in the Canary Islands only started around the 1960s when international surfers came to the islands and were amazed to find such fantastic surfing conditions within Europe. The Canary surf was featured in books written by some of these surfers and so their fame began. Locals started surfing soon after, in the late 60s and then in ’73 the first surf club was established. It was the warm and friendly local vibe, the perfect weather and the amazing waves that got international surfers to come and surf the islands, but locals soon found themselves inspired and nowadays surfing is so widespread, there’s even cases of localism on some beaches where people have become very protective of the wonderful breaks. But do not worry: The surf classes at Surf Camps Canary Islands only take place at the savest spots. 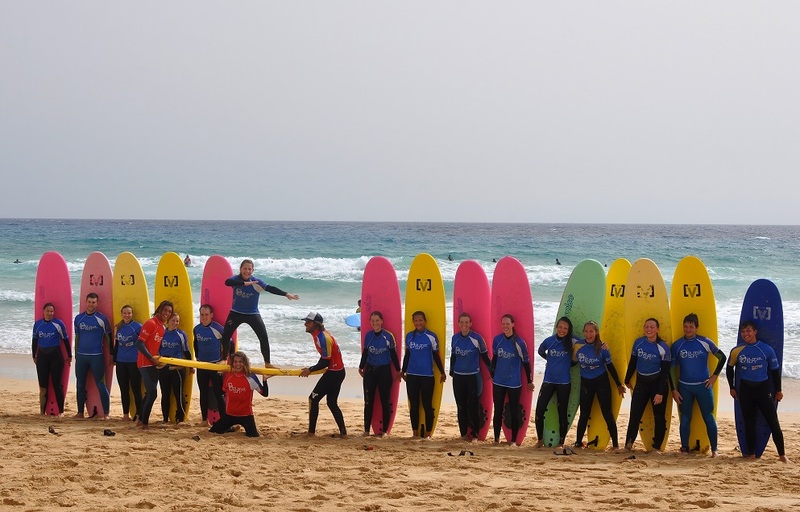 Planet Surf Camps Canary Islands is all about learning and improving in the beautiful sport. 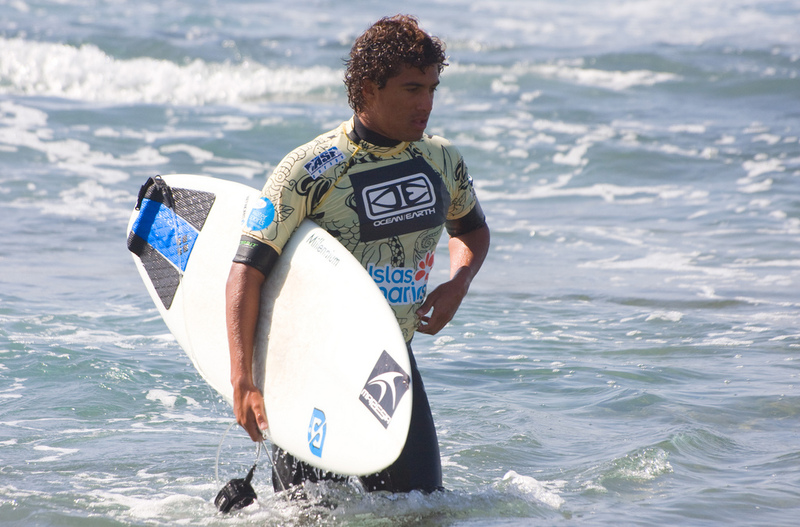 If you want to see what is possible when you surf everyday, visit one of the cool surf events around the islands. When should I go and how do I get there? Surf Camps Canary Islands are well known for the fact that the spots here offer great quality surf all year round, however the best time for a surf holiday has to be narrowed down to winter and spring, mostly November through February. When winter hits Europe, the Canaries are still sunny and warm and this is when the best waves can be expected. Summer is amazing as well, the temperatures are higher, but the ocean can get flat sometimes. If you do choose to come in winter, you may need a thin wetsuit and booties – the bottom is sharp and rocky in many spots, plus the sea bed is dotted in urchins. Getting to the Planet Surf Camps Canary Islands is relatively easy, there are airports on all of the islands, but most international flights arrive in Fuerteventura, Tenerife, Lanzarote or Gran Canaria. Check out cheap travel websites like Skyscanner to find your best deals, but in general flights are easily available all year round. Even though the Canaries are on Africa’s coast, they’re much closer than you’d expect – it’s just around 3h on a plane from Spain and between 4-6 from Germany. 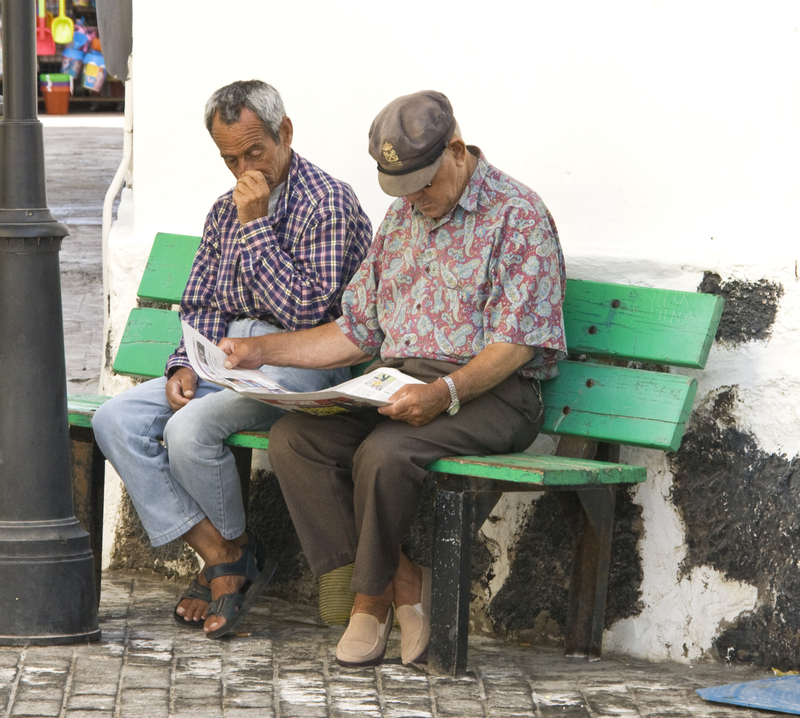 People love visiting the Canary Islands for many reasons, but a major factor is the warm and friendly attitude of local people. Many attribute this to the eternally sunny weather, if you woke up to sun and a blue sky every day, wouldn’t you always be happy too? Culturally, the main language of the islands is Spanish, although the dialect is a bit different from Castellano, it has influences from the original settlers of the islands, Guanches, as well as Latin American and Southern Spanish. However, language won’t ever be a problem as nowadays pretty much everyone can speak English and in any resort or bigger town you will find people that can speak other popular languages like German or French. In terms of attitude to tourists in the water, there are certain areas that locals prefer to keep for themselves and tensions can arise if visitors behave in a disrespectful way, but if you know what you’re doing and know your surf culture, you’ll be fine. Besides, your surfing instructor will take you to a spot where you likely won’t have to worry about being in someone’s way. The Canary Islands’ climate is something that wins them the comparison to Hawaii, it could be described as subtropical and desertic. The islands closer to Africa like Fuerteventura and Lanzarote get a very warm and dry climate and make for very reliable holiday destinations as sun is a virtual certainty at any given time. The outer islands do get tropical rains sometimes and they look much greener than their Easterly neighbours. The temperatures vary only slightly between summer and winter, on average 18 degrees in winter and 24 in summer. The water is 19 to 22 degrees all year round, so it’s much warmer than the surf anywhere else in Europe, especially in the winter months – Surf Camps Canary Islands provide the perfect tropical escape from the cold! One of the must-tries if you’re ever out and about in town is papas arrugadas. Papas is simply a term used for potatoes, but something about this special Canary type of potatoes makes the dish that much more appealing. 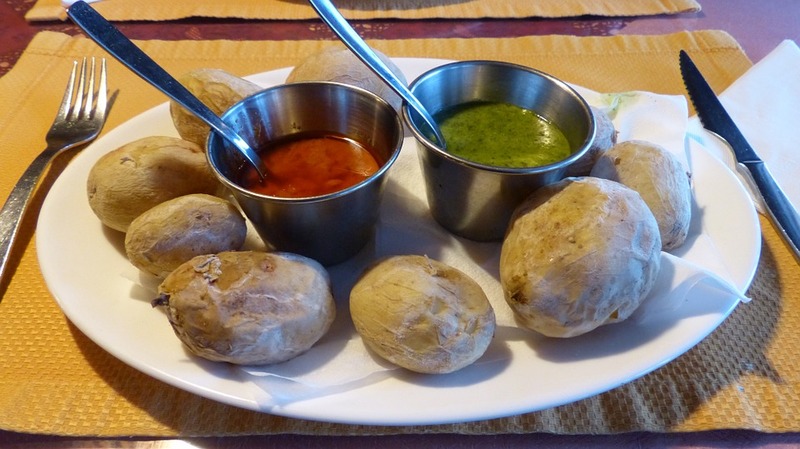 These small and wrinkly-skinned papas are boiled in salty water and served with a lavish serving of the local favourite dip – mojo picón. 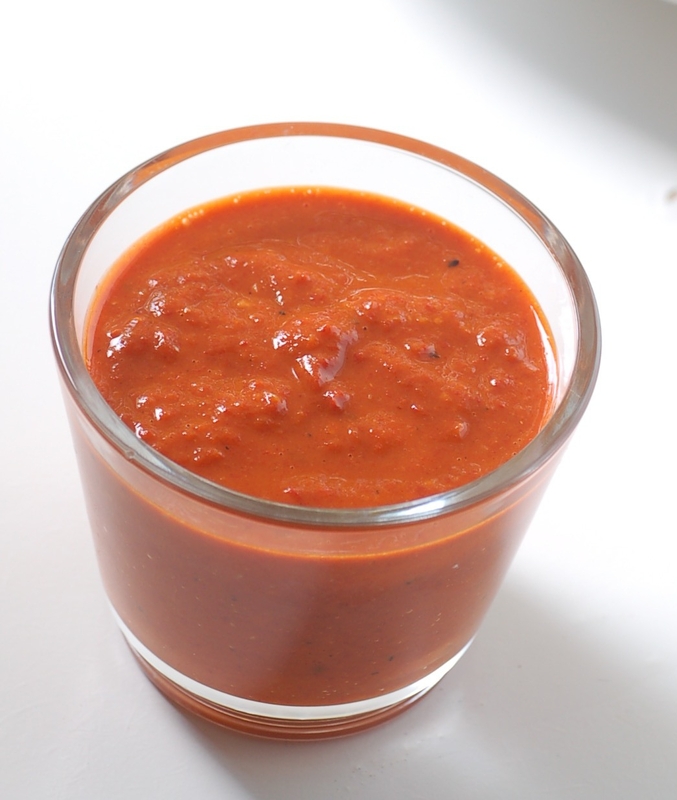 Mojo picón is a staple spicy dip made with oil, garlic, red pepper, vinegar and many spices that could be found on the side of pretty much any plate. It goes well with meats as well as fish and obviously, papas. Other traditional foods include gofio, which is a type of wheat and maize starchy powder traditionally used by Canarians as the base of a healthy and balanced diet. It’s added to milk at breakfast, to soups and sauces as thickener and to breads and cakes. The more recent uses of gofio are for ice cream or other desserts. Something worth trying out it the local cheese Flor de Guía, which is protected by Denomination of Origin. It’s quite a mild and creamy and it’s made from a mix of sheep, cow and goat milk. 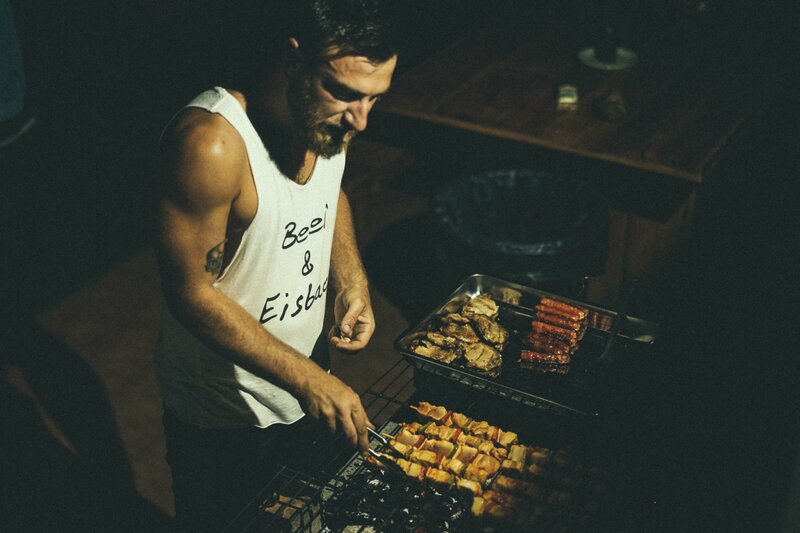 Meat is also very important in Canarian cuisine. It’s the star of famous dishes like ropa vieja (chicken, beef, potatoes and chick peas, or garbanzos), conejo al salmorejo (rabbit stew in coriander sauce) or carne fiesta (a traditional pork meat feast). 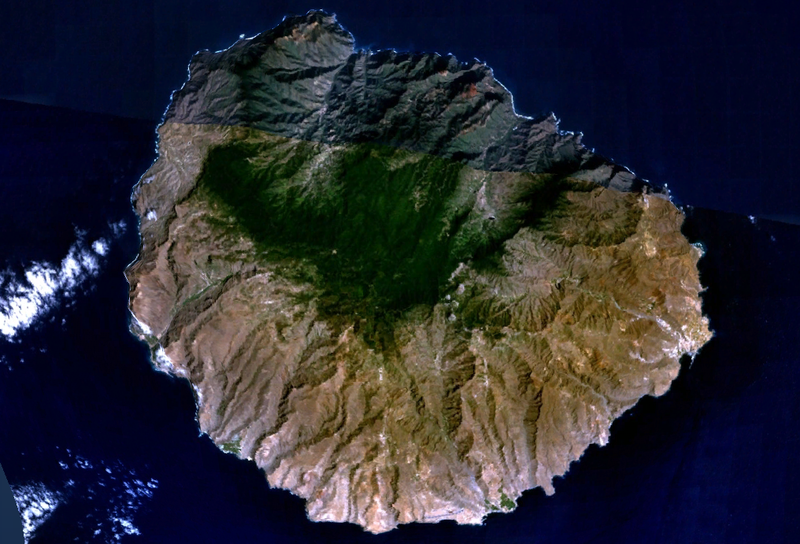 An interesting product of the Islands is miel de palma, which is typical for the island of La Gomera. It’s a sweet palm tree sap used in desserts and with cheese. Speaking of desserts, one that’s definitely worth trying is bienmesabe – this sweet is made with almonds, sugar, lemons and eggs. It’s traditional for Gran Canaria and funnily enough, the name is quite self-explanatory as it means “tastes good to me”, that must mean something! In terms of alcoholic beverages, there are a couple worth mentioning like Ron Miel, for instance. Ron miel, or honey rum, is a strong and sweet rum made with molasses. The result is an intense and beautiful rum that has become a staple for the Islands. The Canary Islands also have their own brands of beer called Tropical and Dorada to be enjoyed at bars. Surfing is for sure THE highlight here. Nevertheless, beyond our Surf Camps Canary Islands you will find loads of cool activities and places to visit. For all of you looking for special attractions on your surf trip, there’s nothing more exciting and vibrant than the world famous Santa Cruz Carnival. 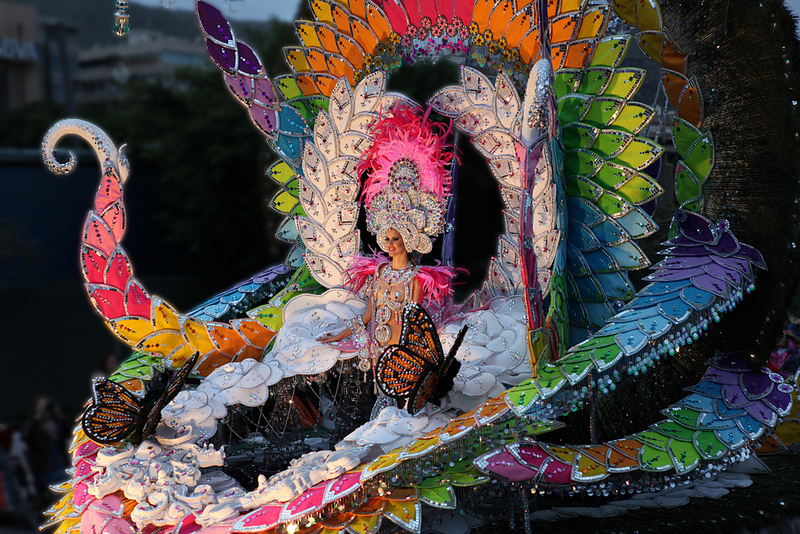 If you find yourself on Tenerife in February, it’s definitely worth dressing up and joining the celebrations. This breathtaking Thai-themed water park is always popular with family trips or friends days out. There’s a huge amount of rides to thrill even those tough to impress and if you’re still not convinced, there’s also plenty of restaurants and beautiful buildings to feast your eyes upon. There is no one specific spot to pinpoint on a map for this activity, as the islands are so full of stunning beaches and coastlines that you won’t be disappointed anywhere you choose to go. If in doubt, Tenerife is always a good bet! 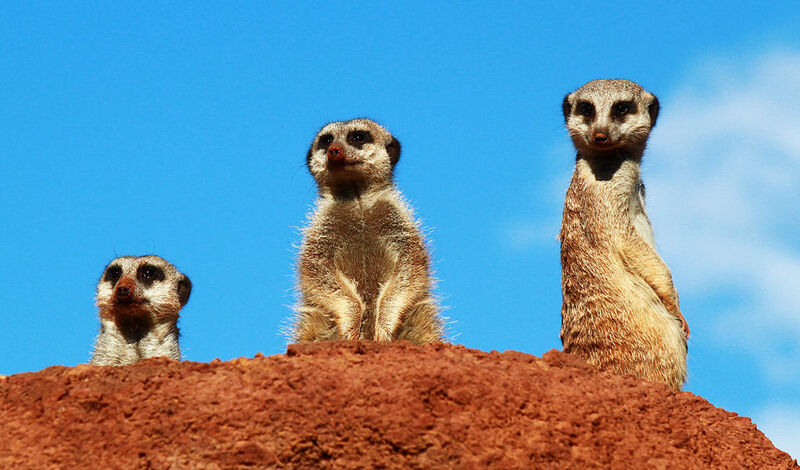 Self-claimed must see attraction when visiting Tenerife, Loro Parque is a famous zoo comprised of many types of mammals, birds, fish and reptiles. 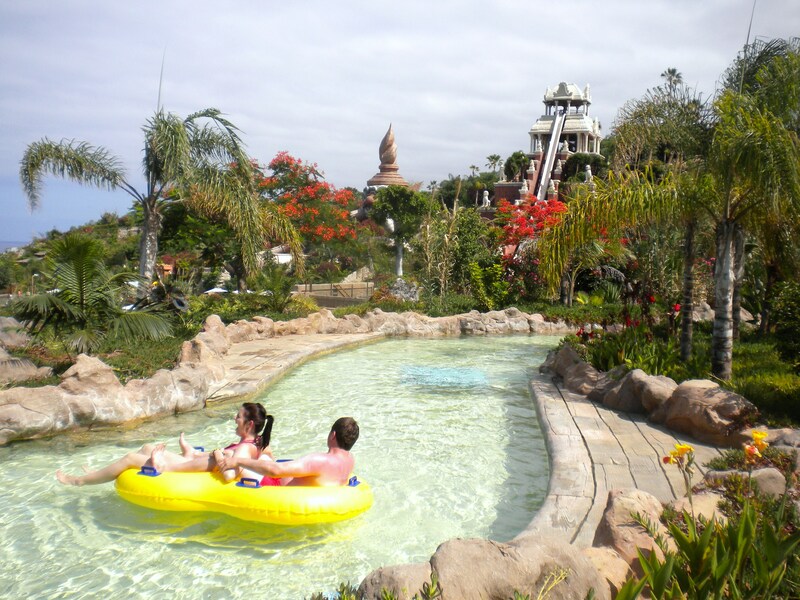 Not far away from our Surf Camps Canary Islands is the Oasis Park. It is a natural reserve that is home to over 250 animal species and a pretty unique botanic garden. It’s a place to learn about and celebrate nature and its diversity, a lot of research is carried out here and the sights are spectacular. There is nothing more liberating than galloping on the cliffs or on the beach at sunset, wind in your hair, water splashing around and a gorgeous and graceful animal underneath you. There’s plenty of yards on the island that offer trail rides for all level riders, on both horses and ponies. It’s definitely an unforgettable experience. 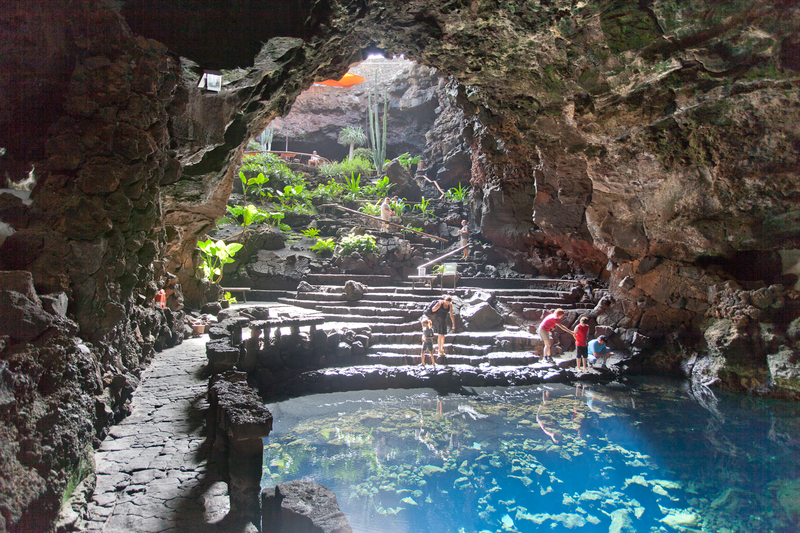 This 3000 year old lava tube on Lanzarote has such remarkable natural beauty, that it would be a crime not to stop by and explore it. It’s a captivating sight that won’t disappoint. 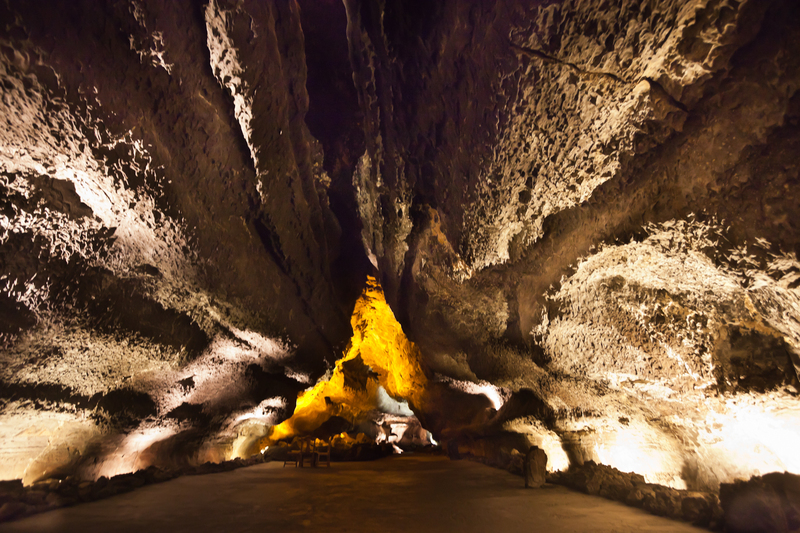 This is the perfect chance for you to discover what the islands were like in pre-conquistador times, when people lived in caves and filled their walls with unbelievable art. There’s plenty of history to read off the walls and unlike most archaeological sites in the Canaries, this one is located rights in the middle of a city. 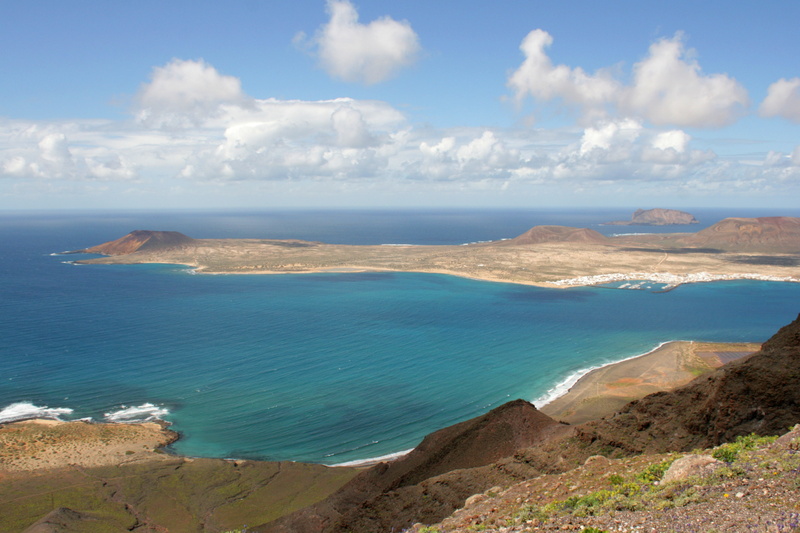 If you ever want to escape the tourists and do something off the usual trail, hop on a ferry from Lanzarote to La Graciosa, a tiny island with only about 700 inhabitants. Take your board with you if you please and enjoy a tranquil day on a paradise island still close enough to civilisation. This delightful local market is the perfect place to treat yourself to the island’s traditional foods and absorb Canarian culture in full. There is no better place to try some local honey, the famous miel de palma, almagrote (a famous local spicy cheese) as well as gomero goats cheese with some mojo. The Canary Islands are truly Europe’s surfing treasure, it’s always summer here and there’s great waves all year round. 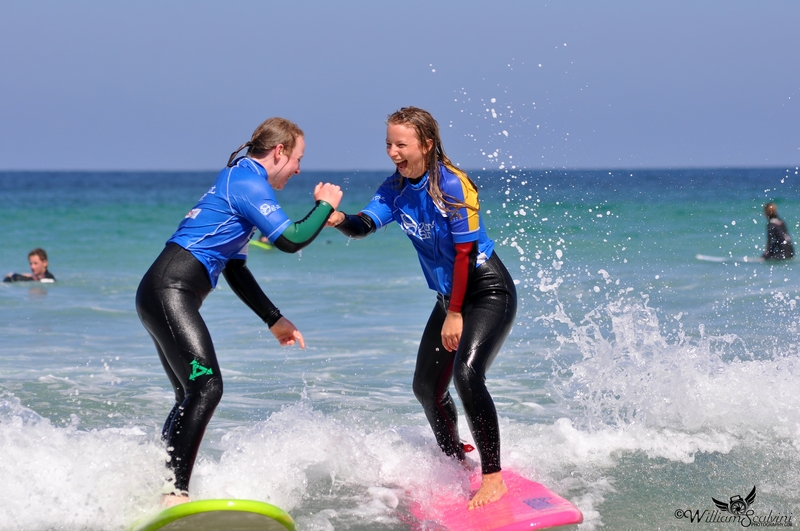 The wide variety of breaks ensures that no surfer will be bored and our experienced surf instructors will guarantee that you’re always safe and using equipment best suited for your level. Fortunately, many members of Planet Surf staff are Islanders themselves, or have at least spent many years of their lives here, which means that they have extensive experience on which spots to get you to on the right conditions. They will also advise you on things like where to go out to party or eat. The mesmerising nature of the Canaries is enough to attract most, but the chilled out, happy vibe, wide array of activities you can do besides surfing and wonderful climate definitely add to the charm of the archipelago. The Islands are perfect both for a family holiday and a solo trip, so Planet Surf Camps Canary Islands offers both options, a Family Surf Camp and a regular adult Surf Camp. 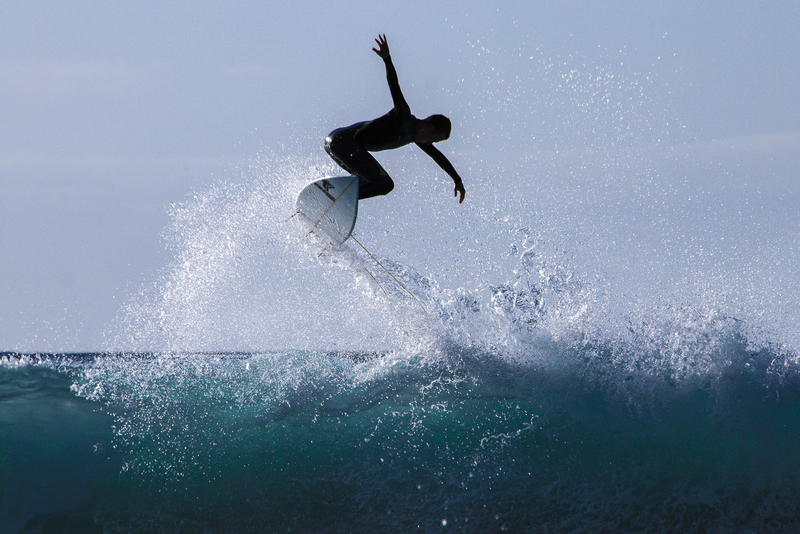 We believe Surf Camps Canary Islands will enchant you, as it did us. You can book your surf holiday here: Booking. See you there!